This is a highly useful collection of recipes for those suffering from multiple food allergies, most commonly milk, egg, nut allergies. Indian cuisines has many varieties to offer. The author compiled a great collection of Indian cuisines starting from snacks, rice dishes, chicken and meat, and fish menu that are most commonly prepared in Indian household. 1) A fully colored ingredients page with images of the items found in store so that readers can familiarize themselves with the ingredients and find them easily at the Indian stores. 2) Cooking tips - what to avoid and pay attention to during cooking Indian food. 3) Each page has images of the food collected from various online sources, to help readers know how it should look like once prepared. 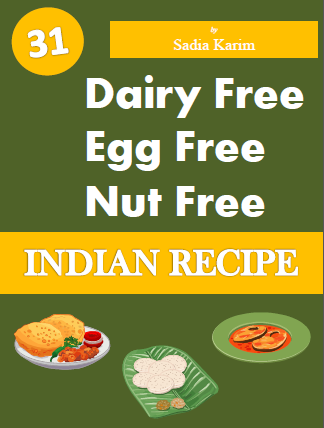 Sadia Karim is the author of “31 Dairy Free, Egg Free, Nut Free Indian Recipe”. Her inspiration was her own child who has been suffering from multiple food allergies since 4 months of age. Sadia Karim dedicated this book to all the parents of children and adults who suffer from food allergies. CLICK the green ‘DOWNLOAD for $9.95’ button for secure checkout via PayPal.